May 2009 – Fight Aging! (An aside: the history of progress can be viewed as science wresting lines of thought from theology, one by one. It started with natural philosophy, how the mechanisms of the world actually work, detoured to capture human origins, and then moved through to cosmology and the origins of the observable universe. Ultimately, or so the semi-serious joke goes, science will capture divinity and eschatology as well. There will be no more of "the answer is God did it" save in reference to the powerful entities we will create and humorously refer to as gods when the urge takes us). Needless to say, I'm cutting short at the neck a number of subtleties in that two line summary, but it's about the long and short of it. If you buy in to, say, the Many Worlds Interpretation of quantum mechanics (which a great many people in the field do) and you are fine with identifying your self as a specific pattern, no matter if there are discontinuities in the existence of that pattern, then you might argue that you are immortal. This of course is all a position. The Many Worlds Interpretation is presently favored, but by no means the only decent interpretation out there. Others exist that do not imply a near-infinite universe full of near-copies of you. Similarly, one can have strong views on identity of the self depending upon personal continuity: which is to say that a copy of you is not you. If you cease to exist, your copies only grant you immortality in the same sense as people have long said that children are a form of immortality. You won't be around to enjoy it, but it might give you some personal satisfaction whilst you are still alive to have such feelings. My own leanings are towards continuity when it comes to extending your existence. You only have one life to live, there's only one you (regardless of how many copies there may or may not be thanks to the way in which the universe works or future mind emulation technologies), and the situation is not complicated by taking place inside a simulation. This, at least, is what I think we have to assume. What you see is what you get, in other words - act as though you're not a brain in a jar being fed the perception of living in an infinite multiverse. The risk of sliding off into the space of lazy philosophical immortality is that you don't contribute to longevity science, don't work to lengthen your own life, and therefore cease to exist many years before you otherwise would have done. Not a risk worth taking just to save a little hard work. A little damage can be a good thing in a self-repairing system: "Oxidative stress has been linked to aging, cancer and other diseases in humans. Paradoxically, researchers have suggested that small exposure to oxidative conditions may actually offer protection from acute doses ... One major contributor to oxidative stress is hydrogen peroxide, converted from a type of free radical that leaks from the mitochondria as it produces energy. ... [Researchers] used the rich functional genomics toolbox of yeast to identify pathways involved in the cell's adaption to hydrogen peroxide. Adaption (or hormesis) is an effect where a toxic substance acts like a stimulant in small doses, but is an inhibitor in large doses. ... This finding may explain recent studies suggesting that eating less may, in fact, raise [oxidant] levels - and, in doing so, provide protection from acute doses of oxidants. This is counter to the hypothesis that caloric restriction extends lifespan in some species because it reduces [oxidants] produced as a by-product of the energy generated by mitochondria. ... It may be that adaption to oxidative stress is the main factor responsible for the lifespan-expanding effects of caloric restriction." Possibly, but my money is still on enhanced autophagy as the major mechanism. The failing heart is the focus of much of the early work to develop stem cell therapies. There are many good reasons for this: the heart is an organ of compartively simply structure (versus, say, lungs), well understood, and the market for any improvements over present therapies is both lucrative and vast. Any sane person would pay the cost of heart surgery for a procedure that was both far less risky and more beneficial to long term health. The time and expense required to move therapies from lab to clinic is now so huge, however, that significant improvements are achieved in the laboratory well before applications of the early results are available to the public. This is yet another thing to blame on the ridiculous nature of the FDA's regulatory requirements. So much good could be achieved in the absence of that stifling bureaucracy. Here's an illustrative piece for those of us who have been following progress in first generation stem cell therapies: incremental improvements in delivery, the ability to isolate and culture more useful stem cell populations, and researcher experience is producing improvements in the outcome without any great change in the basic model. Find stem cells, put them in the patient, and then stand back and watch the resulting regeneration. Clinical trials of myocardial stem cell therapy traditionally have relied on surgery - infusing the stem cells directly into the heart or injecting them into the myocardium, the heart muscle - invasive methods that can result in harmful scar tissue, arrhythmia, calcification or small vessel blockages. "In our research with a swine model of heart failure," said Lee, "we've found that only 1-to-2 percent of [mesenchymal stem cell ] MSCs infused into the myocardium grafted into the heart, and there was no evidence that they differentiated into heart muscle cells. In addition, diseased tissue is not a healthy environment for cell growth. "For these reasons, and because patients with heart failure are not good surgical risks, it made sense to explore a non-invasive cell delivery approach," said Lee. "An important feature of MSCs is their ability to produce a plethora of tissue healing effects, known as "tropic factors," which can be harnessed for stem cell therapy for heart failure. "Since skeletal muscle is the most abundant tissue in the body and can withstand repeated injection of large number of stem cells, we thought it would be a good method to deliver MSCs," Lee said. "We hypothesized that MSCs, via secretion of these functionally synergistic trophic factors, would be able to rescue the failing heart even when delivered away from the myocardium.This study proves our hypothesis"
this non-invasive procedure increased myocytes, or heart cells, by two-fold and reduced cardiac tissue injury by 60 percent. The therapy also improved function of the left ventricle, the primary pumping chamber of the heart, by 40 percent and reduced fibrosis, the hardening of the heart lining that impairs its ability to contract, by up to 50 percent. It's a very good illustration of the current understanding of how stem cell transplants work - it's largely due to biochemical signals emitted by the new stem cells. They issue marching orders and cells already present in the body act upon them. This suggests that the next phase of regenerative research is to do away with stem cells as a part of the therapy and focus instead on replicating the beneficial signaling mechanisms directly. From Ouroboros: "The free radical theory of aging (FRTA) was first advanced by Denham Harman more than 50 years ago. The theory proceeds logically from a small number of straightforward assumptions, based on observations from radiation biology ... Over a half-century, the FRTA has evolved substantially (eventually focusing on the mitochondria as a major source of the initially postulated endogenous radicals), and has lately been the subject of several reviews evaluating its explanatory power and extent of current acceptance. ... The basic chemical process underlying aging was first advanced [in] 1954: the reaction of active free radicals, normally produced in the organisms, with cellular constituents initiates the changes associated with aging. The involvement of free radicals in aging is related to their key role in the origin and evolution of life. The initial low acceptance of the FRTA by the scientific community, its slow growth, manifested by meetings and occasional papers based on the theory, prompted this account of the intermittent growth of acceptance of the theory over the past nearly 55 years." From MedPage Today: "The pathological features of Alzheimer's disease -- tangles, neuritic plaques, and diffuse plaques -- may not be as representative of clinical dementia in the very old as in the younger elderly ... For example, a 75-year-old with a moderate-to-severe burden of neurofibrillary tangles in the hippocampus was much more likely to have had a dementia diagnosis than a 95-year-old with the same amount of tangles. ... it will become even more important to understand the atypical cases of older old persons who are cognitively intact despite having neurodegenerative-disease lesions. ... their findings suggest that current disease-based classifications made on the basis of discrete entities, such as Alzheimer's disease, vascular dementia, or mixed dementia, are [a] simplification." One thing that leaps to mind here is that a 95-year-old is much less likely than a 75-year-old to have been overweight and suffered metabolic syndrome (by virtue of having avoided death by all the age-related conditions that follow that state) - and Alzheimer's appears to be very much like diabetes in terms of its relationship to metabolism and excess fat. The reason for MB4L is that we are working to reduce the "aha! gap" or conceptual hurdle for the billions of folks for whom a leap straight to the idea of extending healthy life is too vast and daunting a gap. The new effort - focused on the short term and exemplified by MB4L - is designed to gain the positive attention of the 99.9% of the population who have been too busy to pay attention to the real underlying problems [of degenerative aging], but to whom life has handed a very sad but compelling imperative - i.e. "I (or my loved one) has Cancer (or some other life-threatening condition)!" The goal of MB4L is to provide serious, valid and relevant medical information, family and community support, education and hopefully lifesaving insights to such people at very low cost. At the same time while adding supporters and generating donations in behalf of the foundation and its longer-term mission. During their involvement with MB4L it will become clear to MB4L's participants that the real enemy to defeat is the insidious underlying process that made them or their loved ones vulnerable to the disease that eventually attacked them. In a sense, MB4L is a real bridge that saves lives both in the present AND in the future. It is a bridge that brings people to understand the larger goals at a time when they are willing and able to listen. I think you'll have to agree that Dave Gobel has been batting a pretty good average to date with his Methuselah Foundation initiatives. It's also very true that we as a community need to do better in education, outreach, and advocacy: the world is still largely filled by people who shrug their shoulders or who have never given a spare thought to engineered longevity and the defeat of aging through medical science. So give this one a chance. Shorter telomeres appear to be a bad thing, but their relationship to longevity is not straightforward: "Although telomere length (TL) is known to play a critical role in cellular senescence, the relationship of TL to aging and longevity in humans is not well understood. In a large biracial population-based cohort, we tested the hypotheses that elderly persons with shorter TL in peripheral white blood cells have poorer survival, shorter life span, and fewer years of healthy life (YHL). ... TL [was] not associated with overall survival or death from any specific underlying cause including infectious diseases, cancer, or cardiac and cerebrovascular diseases. TL, however, was positively associated with more YHL. Findings suggest that TL may not be a strong biomarker of survival in older individuals, but it may be an informative biomarker of healthy aging." Which suggests to me that telomere length is broadly associated with all sorts of poor health and age-related decline, but modern medicine is blunting the resulting hit to life expectancy. Questions of cause and effect remain, however: is telomere shortening merely a reflection of other age-related damage, or a fundamental damage-causing process itself? What could medical science do with a reliable way of generating new neurons in the brain? "Researchers have identified a new mechanism that plays a central role in adult brain stem cell development and prompts brain stem cells to differentiate into neurons. Their discovery, known as Integrative FGFR1 Signaling (INFS) [is] considered capable of repopulating degenerated brain areas, raising possibilities for new treatments for Parkinson's disease, Alzheimer's disease and other neurodegenerative disorders ... The approach uses gene engineering and nanoparticles for gene delivery to activate the INFS mechanism directly and promote neuronal development. The INFS-targeting gene can prompt these stem cells to differentiate into neurons. ... the research team set out to see if it is possible to generate a wave of new neurons from stem cells and direct them to the affected areas. ... [There is] the need for further development of gene delivery methods for the treatment of neuronal loss. ... Targeting the INFS mechanisms by small molecules could potentially replace the need for gene transfers and create a classical drug therapy for the neuronal loss." One of the issues inherent in research of a late stage age-related condition is that a lot of different things are going wrong with the body at the same time. The comparatively few categories of age-related damage have spilled over into hundreds of different types of malfunctions and the further disarray resulting from those malfunctions. By way of an analogy, consider rust in a machine: rust is a simple process, but the way in which the machine eventually breaks down can be a very complicated sequence of failing components and chained consequences. So it is with aging. But inflammation appears to worsen Alzheimer's, some research has shown some short-term improvements to Alzheimer's patients by blocking inflammation, and the AGE/RAGE interaction boosts inflammation. Alzheimer's disease (AD) is the most common dementing disorder of late life. Although there might be various different triggering events in the early stages of the disease, they seem to converge on a few characteristic final pathways in the late stages, characterized by inflammation and neurodegeneration. In this review, we revisit the hypothesis that advanced glycation endproducts (AGEs) and their receptor RAGE may play an important role in disease pathogenesis. Accumulation of AGEs in cells and tissues is a normal feature of aging, but is accelerated in AD. In AD, AGEs can be detected in pathological deposits such as amyloid plaques and neurofibrillary tangles. AGEs explain many of the neuropathological and biochemical features of AD such as extensive protein crosslinking, glial induction of oxidative stress and neuronal cell death. Oxidative stress and AGEs initiate a positive feedback loop, where normal age-related changes develop into a pathophysiological cascade. RAGE and its decoy receptor soluble RAGE, may contribute to or protect against AD pathogenesis by influencing transport of beta-amyloid into the brain or by manipulating inflammatory mechanisms. This is characteristic of the present stage of research into end-state conditions of aging. Researchers are piling up correlations and mechanisms, which lead in turn to plausible hypotheses, but nailing down the final answer as to how it all fits together to produce a specific final catastophe has yet to happen. It's a very challenging, complex task. The labor of this final assembly, and then the even greater labor of figuring out what to do next, is the work sidestepped by engineering approaches to longevity science, such as SENS. We know that an accumulation of AGEs is a difference between young and old tissues, therefore we should work to safely get rid of it. While all extra information helps, we don't need to know exactly how this build up of AGEs causes issues to be reasonably certain we're going to create a net benefit in health by removing it. An exercise in joining the dots here: TOR, or target of rapamycin, is known to be important in calorie restriction in species ranging from yeast to mammals. We also know that autophagy, the process by which cells recycle damaged components and break down unwanted molecules, appears to be required to gain the benefits of calorie restriction. This paper links autophagy, life span, and rapamycin in yeast, closing the circle: "Rapamycin is an antibiotic that stimulates autophagy in a wide variety of eukaryotes, including the budding yeast Saccharomyces cerevisiae. Low concentrations of rapamycin extend yeast chronological life span (CLS). We have recently shown that autophagy is required for chronological longevity in yeast, which is attributable in part to a role for autophagy in amino acid homeostasis. We report herein that low concentrations of rapamycin stimulate macroautophagy during chronological aging and extend CLS." 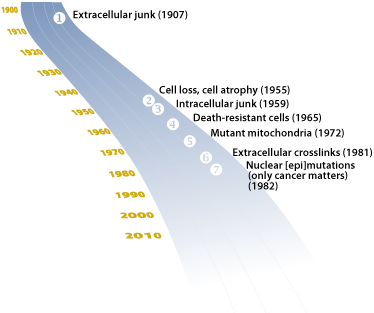 Many lines of evidence point towards autophagy as an important determinant of longevity. I suspect this is because more autophagy means fewer damaged mitochondria, but that thesis is as yet unsupported by a good weight of evidence. From ScienceDaily: scientists "have tamed a virus so that it attacks and destroys cancer cells but does not harm healthy cells. They determined how to produce replication-competent viruses with key toxicities removed ... Cellular microRNA molecules regulate the stability of [messenger RNA] in different cell types, and this newly-understood mechanism provides the possibility to engineer viruses for cell-specific inactivation. [This is] a mechanism whereby wild type virus potency could be maintained in tumor cells but the virus could be 'turned off' in tissues vulnerable to pathology. ... This approach is surprisingly effective and quite versatile. It could find a range of applications in controlling the activity of therapeutic viruses, both for cancer research and also to engineer a new generation of conditionally-replicating vaccines. ... Although the current tumor-killing virus is useful in mice, transfer of the technology into the clinical setting will require re-engineering of the virus to overcome virus pathologies seen in humans, and it will be at least two years before this can be tested in the clinics." You might recall that mice genetically engineered to generate more of the antioxidant catalase in their mitochondria live longer in good health. Similarly, ingested antioxidant compounds engineered to migrate to the mitochondria have much the same effect (but don't go looking for that in the stores - it's only in the lab so far). Other ingested antioxidants are a wash - no effects, or negative effects. Here's an update from the group working on catalase-producing mice: "Age is a major risk for cardiovascular diseases. Although mitochondrial reactive oxygen species have been proposed as one of the causes of aging, their role in cardiac aging remains unclear. We have previously shown that overexpression of catalase targeted to mitochondria (mCAT) prolongs murine median lifespan by 17% to 21% ... Cardiac aging in mice is accompanied by [a number of characteristic biochemical and structural forms of damage and change in the heart, heart tissue, and heart cells]. All of these age-related changes were significantly attenuated in mCAT mice." Much as one would expect: less damage to cells and tissues means a longer life, on average. Researchers have uncovered a difference that may explain why other primates don't suffer from Alzheimer's disease; it remains to be seen what can be done with this information. Via Yahoo! News: "Humans get the devastating neurological disorder known as Alzheimer's disease, but their closest evolutionary cousins don't. Even more inexplicable is the fact that chimpanzee and other non-human primate brains do get clogged with the same protein plaques that are believed by many to cause the disease in humans. ... a 'tag' molecule used to track plaque build-up latches easily onto plaques in human brains but not in those of apes and monkeys, suggesting that there is a basic structural difference between the two types of plaque. Figuring out the difference, they said, could lead to ways to render human amyloid plaques as harmless in human brains as they are in the brains of other primates. ... This is another finding of unknown significance, but it is a finding. None of us know why these higher primates don't get Alzheimer's disease, but we don't [fully understand the mechanisms that lead to human] Alzheimer's disease either. Where it leads us, I don't know." A good many people don't want to live longer healthy lives. That's their choice and you have to respect it, no matter how they arrived at their present view, or how much you suspect they'll change their tune later once health crumbles and the science of longevity looks even more feasible. One of the most fundamental freedoms is the freedom to wind down your life in the manner of your own choosing - a freedom that's actually sadly lacking these days. If you can't even die on your own terms without government employees hounding you to obey just how deep are the depths of your slavery? A related aspect of this age of gargantuan, proactive government is that "because I want to" has fallen out of favor as a permissible answer. No-one should feel pressure to provide any other reason for their private, personal decisions. But justifications are the spirit of the era; every personal choice must be justified, or it has no value - with the implied message being that Big Brother will take your toys away if you can't put up a good legal defense of your own decisions. All that is not permitted is forbidden: the totalitarian urge that seeths in every growing system of government. You see this need to justify in all sorts of debates and dialogs, and it seems to me an inadvertently learned echo of the sort of nonsense that permeates the political sphere. People will trot out any talking point, no matter how nonsensical or debunked, to avoid the appearance of a choice made without "justification." The rot is deep, sadly. I leave it up to you to decide how contributing factors to this behavior are split between evolved human nature (the ape's desire for hierarchy, approval, and walking with the crowd) and the specific culture in which people learn how to be civilized (or "civilized" as the case may be). So, you see points of view rather like this one I noticed today, a fellow who doesn't want to live longer. Still, the practical is less important to me than the ethical and theological problems surrounding the death of death; even if we could do this for everyone, would ending illness and death be a good thing? For humanitarian reasons, I concur with Dr. de Grey: In general, I believe we have a responsibility to alleviate pain and suffering, and I try to live my life around this belief. The gist of it is that he grasps all the humanitarian arguments for ending the suffering and death of aging, but says "not for me, and not a good idea for anyone else" with the flimsiest of points or unexamined beliefs as cover. It actually covers many of the common items put forward by people who try to justify their instinctive discomfort with change of the magnitude implied by radical life extension, all of which are paper-thin objections. Boredom - how many times can you watch that film? The lesson to take away here, I think, is that arguments against engineered healthy longevity and elimination of age-related disease are not always what they seem to be at the surface. Sometimes they are sincere, sometimes they are group membership flags, waved to show you're a Malthusian / environmentalist / other form of human being who advocates courses of action that would condemn billions to death, and sometimes they are no more than the unexamined fig leaves grasped by someone who was educated to believe that "because I want to" is unacceptable. The Times of India reports on early results in using stem cells to repair nephritis: Indian researchers claim "to have pioneered stem cell therapy for the first time on patients suffering from acute and chronic nephritis which may end in kidney failure. Nephritis is an early kidney disease which in many cases is chronic and becomes resistant to drugs. The disease may lead to kidney failure. Since we are doing stem cell therapy for kidney transplant patients, we decided we should also try using it to prevent kidney failure as well ... The stem cell therapy for nephritis has been done in two patients. ... The bone marrow and mesenchymal stem cells were delivered directly into the kidneys through [an artery] so as to help the organ repair the damage. ... This treatment is at experimental stage as we are still working out the dose of stem cells per kg that a patient may need for best results." Both patients greatly improved, to be point of being able to claim a cure, but as noted this is very early stage work. Still, India is not the US; while its regulators are excessive, they are nowhere near as bad as the FDA. So expect to see medical tourism for this therapy within the next year or two. The hypoxic response (the way in which cells respond to low oxygen levels) can be beneficially manipulated to produce a number of positive results, such as triggering cells to work harder to remove a buildup of damaging biochemicals. Now it seems that this signaling system is also involved in calorie restriction, and may be the cause of some fraction of the resulting health and longevity benefits: "HIF-1 (hypoxia-inducible factor 1) [helps] cells survive by 'turning on' when oxygen levels are low. ... [scientists] have shown that HIF-1 is also a key player in dietary restriction. HIF-1 is involved in a molecular pathway known to regulate cell growth and metabolism in response to nutrients and growth factors. ... the molecular mechanisms involved in how dietary restriction slows cancer and extends lifespan have been largely unknown. ... This study gets us closer to understanding that process and gives us better targets for both designing and testing drugs which could mimic the effects of dietary restriction in humans ... The research involved nematode worms that were genetically altered to both under and over-express HIF-1. The animals, which are the most-often used model to study aging, were fed different diets. Animals that were designed to over-express HIF-1 did not get the benefit of lifespan extension even though their diets were restricted. Animals that under-expressed HIF-1 lived longer, even when they had a nutrient-rich diet." You might recall a comparatively recent synthesis of Parkinson's research into a complete view of how the condition kills vital neurons. Here's more along those lines: alpha-synuclein (ASYN) "is an abundant neuronal protein closely linked to Parkinson's Disease (PD) pathogenesis ... The mechanisms through which [ASYN] leads to neuronal death in Parkinson's disease (PD) are uncertain. In isolated liver lysosomes, mutant ASYNs impair Chaperone Mediated Autophagy (CMA), a targeted lysosomal degradation pathway; however, whether this occurs in a cellular context, and whether it mediates ASYN toxicity, is unknown." The authors go on to show that yes, alpha-synuclein does disrupt autophagy - which means that cells will eventually die due to accumulating waste they cannot remove. This is, in effect, an unfortunate and very localized acceleration of one of the known causes of aging: a build-up of unwanted biochemical detritus inside our cells. Whatever the outcome for Parkinson's disease, we would all benefit from therapies capable of removing biochemical junk that our cells cannot deal with themselves. Autophagy is the process by which cells break down unwanted biochemicals and damaged components. More autophagy taking place in your cells appears to be all upside based on what we see happening under the hood during calorie restriction, and based on the use of other fairly crude methods of boosting autophagy. It looks very much like increased autophagy increases longevity and improves long term health. Cellular senescence on the other hand is a mixed bag; a mechanism that does bad things to you so as to avoid worse things. A cell that lapses into a senescent state due to damage no longer divides, but just sits there emitting biochemical signals that harm the immediate cellular environment - and also hopefully flag the cell for destruction by the immune system. On the one hand this is very effective at preventing runaway replication of damaged cells, i.e. cancer. On the other hand, these harmful senescent cells start to accumulate rapidly with advancing age and collectively contribute to the malfunctioning of your tissues and organs. Here we identify autophagy as a new effector mechanism of senescence. ... A subset of autophagy-related genes are up-regulated during senescence: Overexpression of one of those genes, ULK3, induces autophagy and senescence. Furthermore, inhibition of autophagy delays the senescence phenotype, including senescence-associated secretion [of those biochemicals that harm the local cellular environment]. Our data suggest that autophagy, and its consequent protein turnover, mediate the acquisition of the senescence phenotype. Equally, I'm fairly certain that calorie restricted people are not more riddled with senescent cells than the rest of us, so there has to be a way to usefully enhance autophagy without dragging in undesirable results. If you want to dig back a way in the Fight Aging! archives, you'll find another mention of a linking point between senescence and autophagy, this time via the noteworthy p53 gene. Recently it has become clear that p53 not only controls DNA damage responses, senescence and apoptosis but also plays a major role in the control of autophagy. Thus, deletion, depletion, or inhibition of p53 induces autophagy in human, mouse and nematode cells. p53 has long been seen as controlling an evolutionary trade-off between longevity and cancer resistance: either you boost p53 to get more senescent cells, less cancer, and a shorter life, or you reduce p53 to get more cancer and a longer life. It seems that increased or reduced autophagy might be an important factor in that difference in longevity, setting the issue of cancer to one side. That said, I should mention that particularly clever biological engineering has recently shown that you can selectively boost p53 or introduce telomerase as well so as to have your cake and eat it - obtain less cancer and a longer life. Gene expression, the process by which the body manufactures the protein components of molecular machinery and control mechanisms, changes constantly. Some proteins are turned out in greater quantities, some less. This should be an ongoing record of the changes that happen with aging, and therefore also helpful on the path to slowing, preventing, and reversing aging. If we can make any sense of the complexity, that is: "To study how gene changes are related to individual longevity, we need another type of data in addition to gene expression profiles: the survival time of individual animals after their gene expression is measured. With this information, we could determine which transcriptional responses are associated with a longer lifespan, and in principle even develop a personalized medicine approach to aging: we could train a machine learning algorithm to peek at the expression levels of a handful of crucial genes and predict your physiological age - and the number of healthy years you have left. Previous [studies] of aging humans haven't included survival times because we live too long. Recently, some human survival data - together with matching gene expression data from lymphoblastoid cell lines - have become available from a long-range study that began in the early 1980s. In the first aging study to take advantage of this resource, [researchers] mine the data to identify gene changes associated with longevity." To What Extent Is Persuasion Required Beyond the Scientific Community? I believe that widespread public understanding and support of longevity science is a necessary step towards a large and well-funded scientific community focused on achieving engineered longevity. On longer timescales (a decade, a generation), resources for research and development most reliably flow towards the areas of greatest public knowledge, desire, and approval. Just look at the many, many projects that have long been technically possible yet not been accomplished in the past decades: the creation of an orbital flight industry, for example, colonizing the sea, or irrigating the Sahara. Engineering the reversal of aging is a large and multi-faceted project that will run over a generation or more, even once the research community is fully engaged and progress is well underway. Ergo, public support is needed. But let's play devil's advocate for today. The people who will be performing the necessary work to repair and reverse aging are life scientists and the halo of technicians surrounding that core research community. Those scientists also set the stage for the range of projects likely to be approved by funding organizations through education (both direct and indirect), the nature of their grant proposals, and so forth: they are the arbiters of truth when it comes to what is possible. We are fortunate enough to still live in a society where the output of the scientific process is generally regarded as the truth. (Not that the output is always viewed favorably, lacking factions, or easily interpreted, but it does have a weight of respect rarely found elsewhere). So, the argument goes, if you persuade a significant community of life scientists to talk about and be interested in working on aspects of engineered longevity, everyone outside the scientific community will come around to support that work. In this way of looking at things, the scientific community is the seed for bootstrapping widespread support for extending healthy life and widespread understanding of the potential methods of doing so. Start with the scientists and others will follow. Here a research group digs into a common factor observed as a result of a number of different longevity mutations in nematode worms: lower mitochondrial membrane potential, implying increased mitochondrial uncoupling, a process by which mitochondria produce heat rather than chemical energy for the cells. As we already know, greater uncoupling is correlated with greater longevity. "[Mitochondrial] energy production via oxidative phosphorylation generates a mitochondrial membrane potential (DeltaPsim) across the inner membrane. In this work, we show that a lower DeltaPsim is associated with increased lifespan in [nematode worms]. The long-lived mutants daf-2, age-1, clk-1, isp-1 and eat-2 all have a lower DeltaPsim than wild type animals. ... We conclude that longevity pathways converge on the mitochondria and lead to a decreased DeltaPsim. Our results are consistent with the 'uncoupling to survive' hypothesis, which states that dissipation of the DeltaPsim will extend lifespan." Mitochondria are very important to longevity; all the signs point in that direction. Targeted therapies are the immediate future of cancer treatments: destroy only the cells that matter with few or no side-effects. Here, stem cells are used as the targeting mechanism: "Experiments in cell cultures and in mice showed the adult stem cells - a type known as mesenchymal stem cells - could home in on cancer cells and deliver a lethal protein that attacked only the cancer while sparing normal healthy tissue. ... We've developed cells which specifically target cancer through the body and deliver an anti-cancer protein to where it is needed in a seek-and-destroy approach ... [researchers] altered the cells to express or make the cancer-killing protein called TNF-related apoptosis-inducing ligand or TRAIL. ... This protein has the ability to cause the death only of cancer cells. By combining these two approaches, we have a cell which has the ability to go around the body and find and destroy tumors. ... An attractive property of these cells is that they are 'immunoprivileged,' meaning the body will not reject them as foreign invaders. That means they can be made in batches instead of having to make custom stem cell treatments for each patient ... the team hopes human trials could begin in two or three years." As you probably know by now, the well-supported mitochondrial free radical theory of aging tells us that damage to the DNA in mitochondria, the power plants of our cells, is an important root cause of aging. You can look back in the archives for an explanation as to exactly why that is the case. rather than fixing mitochondrial mutations, we can make them harmless to us. By putting "backup copies" of these few remaining genes into the nucleus, we can prevent the harm caused by any mutations that may occur of the original versions. Even without the mitochondrial DNA, the proteins that it encodes will still be produced and incorporated into the mitochondrial machinery, allowing the cellular power plants to continue humming along normally. Aging is associated with a reduction in muscle mass and strength, which compromises functional independence. Skeletal muscle also shows an increase in mitochondrial dysfunction and oxidative stress in older adults. It has been shown that resistance-exercise training increases muscle strength and function in older adults, in association with a reduction in markers of oxidative stress and an improvement in mitochondrial function. Patients with sporadic mitochondrial cytopathies show an accumulation of mitochondrial DNA mutations and deletions in mature muscle, but not in satellite cells. Such patients have shown an activation of the satellite cells following myotoxic trauma and resistance, likely due to a fusion of the relatively quiescent satellite cells with mature muscle, which dilutes the mutational burden, a process called mitochondrial DNA shifting. Preliminary data strongly suggest that mitochondrial DNA shifting occurs in skeletal muscle from older adults following resistance-exercise training. Although the actual number of deletions is lower after training, how are the dysfunctional mitochondria removed (autophagy)? What intensity of training is required to activate the satellite cells to induce shifting? Can we enhance satellite cell activation in older adults to maximize shifting? Are we actually inducing shifting from satellite cells or are we simply removing the mutant mtDNA by autophagy? Then again, the whole thing might just be another health benefit of enhanced autophagy and the satellite cells a good red herring. We shall no doubt learn more in the years ahead. However it turns out, we can't exercise our way to agelessness, however. Studies suggest that an extra decade, give or take, is the plausible difference in life expectancy between regular exercise and a sedentary life style. While exercise and calorie restriction both appear to slow most (even near all) of the effects of aging, far better technologies aimed at repairing the damage rather than slowing its accumulation are both possible and needed. Automation makes products and processes much less expensive, so it's only a matter of time and ingenuity before it's broadly applied to tissue engineering, as noted in this press release: "artificial skin is rare. [The] production is complex and involves a great deal of manual work. At this time, even the market's established international companies cannot produce more than 2,000 tiny skinpieces a month. ... In a multi-stage process, first small pieces of skin are sterilized. Then they are cut into small pieces, modified with specific enzymes, and isolated into two cell fractions, which are then propagated separately on cell culture surfaces. The next step in the process combines the two cell types into a two-layer model, with collagen added to the cells that are to form the flexible lower layer, or dermis. This gives the tissue natural elasticity. In a humid incubator kept at body temperature, it takes the cell fractions less than three weeks to grow together and form a finished skin model with a diameter of roughly one centimeter. The technique has already proven its use in practice, but until now it has been too expensive and complicated for mass production." A general interest article on one of the longest-running human studies from the Washington Post: "Every year hundreds of people travel to Baltimore for an unusual purpose. ... these folks, some of whom have made this journey for decades, believe the trip is worth their time and expense because how they live - calculated according to everything from the strength of their grip to how many apples they consume in a month - may offer clues to how the rest of us might live better, longer, healthier lives. These individuals [are] participants in the Baltimore Longitudinal Study of Aging (BLSA), the country's longest-running study of aging. Since 1958, a total of more than 1,400 volunteers have agreed to regularly undergo in-depth physicals and memory and other screenings conducted by the study's physicians. The resulting data span more than half a century and are a gold mine for researchers interested in the aging process. Because of the BLSA, scientists know that signs indicating that a person could be at risk for dementia and other cognitive diseases may appear 20 years before symptoms emerge. Findings that today are common knowledge (that exercise can help reduce high blood pressure, for one) can be traced back to BLSA's annual physicals and the data analysis done by the study's scientists. Think of it as a vast historical record." Do Broad Commonalities Exist in Cancer? This is the age of biotechnology, and many believe that one of the crowning triumphs of the age will be the defeat of cancer. If we're going to greatly extend healthy human longevity, then the defeat of cancer certainly has to be achieved one way or another. I think that the one of the most exciting possibilities in modern cancer research is that a cure for cancer is in fact easy, but we don't yet know how to do it. Let me explain what I mean by "easy." This is an era in which we can order cells around, identify cells by tiny differences in their surface biochemistry, construct viruses to order, and in which researchers are rapidly deciphering and manipulating the most fundamental mechanisms of our biology. In this sort of background, "easy" means that researchers find some common mechanism necessary to all (or even just most) cancers. Scientists will then pile in and develop a way of attacking cancer by disrupting or manipulating that mechanism, and there the story is done. We'll have a robust cancer therapy, and will reap the benefits thereof. "Hard" on the other hand means that there is no common mechanism shared between more than a tiny fraction of cancers. They're all radically different, even from individual to individual, or between millions of different human genotypes. There can be no one therapy, widespread and constantly improved upon by research and development: curing cancer will mean a vast array of potential therapies for millions of different types of malfunctioning cells. It will be an unending war of attrition. Alternatively, perhaps a common mechanism exists, but getting at it is something researchers don't evisage attaining for decades yet. Aubrey de Grey's WILT or OncoSENS falls into the latter category, I think. In biology as in physics, if you dig down deep enough you're eventually going to find the right plug to pull out of the socket - for WILT it's the lengthening of telomeres required by all cancers. You should read up on WILT to see the biological engineering and remaining research required to make that happen, however; it's not trivial. Right now, the dominant thinking in the cancer research community is that cancer is hard. Everyone would like to see a breakthrough that makes it easy, however. You can see some of this at work in cancer stem cell research in past years. Are these errant stem cells distinctive in any way across some or all cancers, and so a single type of therapy can be deployed for many cancers, or are they as varied as cancers are in all other ways? Are cancer stem cells a path to "easy" or are they just another facet of "hard?" Human immune cells communicate constantly with one another as they coordinate to fight off infection and other threats. Now researchers at Stanford University's School of Medicine have shown that muffling a key voice in this conversational patter is an early step in the progression of human cancers. Silencing an inter-cell signaling mechanism called the interferon pathway may be one way newly developing cancers gain the upper hand. It may also explain the immune dysfunctions seen in many cancer patients and why cancer immunotherapies are often ineffective. Lee and his colleagues had previously shown that the interferon signaling pathway was compromised in melanoma patients. In the current study, the researchers investigated whether patients with two other types of cancer - breast and gastrointestinal - also showed the same defect. They have a clear defect in the interferon signaling pathway," said Lee. When the researchers looked more closely at the lymphocytes from breast cancer patients, they found that the defect was equally severe in samples from people with early- and late-stage cancers - indicating that the problem must arise soon after the cancer begins to develop - and that it was present regardless of whether the patient had ever been treated with chemotherapy. "It's now looking like the interferon pathway may harbor a general immune defect in many types of cancers." One of the many roles of the immune system is to kill off cancerous cells that we all develop but never know about. A single immune system issue that is in fact the root cause of many types of cancer (or rather the root cause of those cancers surviving long enough to threaten their host) would be good news indeed, as it could in theory be detected and corrected early, long before issues arise. There are questions of cause and effect here; is the cancer doing something to the immune system, or is the immune system defect what leads to cancer? The answer to that question is ultimately much less important than whether or not this applies to many other types of cancer. If it's specific to only a few cancers or patient populations, then it will remain one of a thousand similar modestly funded projects. The down side to relying upon the immune system to do the heavy lifting for you in any cancer therapy is that our immune systems decay dramatically with advancing age. This is one of the reasons that cancer is an age-related condition: a faulty immune system less able to do its job. If the cancer research community keeps heading down the road of immunotherapy, as seems likely, I think that increasing resources will be directed towards restoring an aged immune system to youthful function. That is a necessary step to best using the immune system's capabilities to target and destroy specific unwanted cells, whether or not researchers are interested in engineering greater longevity. An academic video from the University of Wisconsin: "Ricki Colman, PhD, reviews the long-term health benefits of caloric restriction (CR) using data from a 20 year study in non-human primates at the Wisconsin National Primate Research Center. She outlines positive health changes associated with longevity including lower diabetes incidence, less age-associated loss of muscle mass, altered energy expenditures, and lower rates of obesity." The human studies show much the same, aside from the longevity implications that have yet to be measured well. That said, there is at least some evidence from the analysis of past studies that calorie restriction contributes to human longevity - but it's nowhere near as solid as the results demonstrated in mice and other lesser species. The evidence for significant health benefits in humans through calorie restriction is, however, very solid. No presently available medical technology even comes close to generating the level of health benefits obtained through eating fewer calories while still obtaining optimal nutrition - which is a state of affairs we'd all like to change. From EurekAlert! : "In osteoporosis, excessive bone resorption occurs. The bones lose their density and are therefore prone to breakage. Even minor falls can lead to serious bone fractures. The interplay between two cell types determines bone density: bone forming cells (osteoblasts) and bone resorbing cells (osteoclasts). The equilibrium between these two cell types is strictly regulated to prevent the formation of either too much or too little bone. ... LAP is the term researchers use to denote the full-length isoform of [the gene] C/EBPbeta, and LIP is the term for the short isoform. LAP activates another gene switch [which] suppresses the formation of bone resorbing osteoclasts. In contrast, LIP, suppresses this gene switch and thus enhances the proliferation and activity of the osteoclasts. As a result, the osteoclasts resorb more bone substance than is built by the osteoblasts. The researchers suspect that imbalance in the ratio between LAP and LIP plays a role in osteoporosis. The activity of a signaling molecule – mTOR – determines which of the two isoforms LAP and LIP is formed. ... it may be possible to develop new drugs that regulate the activity of mTOR and, thus, remedy the disturbance in osteoclast function." mTOR activity, you might recall, is altered by the practice of calorie restriction. As this ScienceDaily release notes, Alzheimer's disease and type 2 diabetes share many of the same risk factors. Pack on the fat and stop exercising and you too can suffer metabolic syndrome that later blossoms into these and other degenerative conditions. "Modern societies face the increasing burden of age-related diseases, in particular Alzheimer’s disease (AD) and type 2 diabetes (T2D). There is some evidence that the causes underlying both diseases are linked. Do AD and T2D represent the endpoint of aged, exhausted, and dysfunctional cells having reached their maximal life expectancy or are AD and T2D the consequences of living in superabundance including excessive food supply, work demands, psychosocial stress, and an excessive sedentary life style? ... The mechanisms relating [excess fat tissue] and T2D to AD may include hyperinsulinemia, advanced products of glycosylation, cerebrovascular disease, and products of adipose tissue metabolism. The implication of these associations is that a large proportion of the world population may be at increased risk of AD given the trends for increasing prevalence of overweight, obesity, hyperinsulinemia, and T2D. However these associations may also present a unique opportunity for prevention and treatment of AD." What Can Be Achieved With Artificial Tissue? Scientists are presently working towards artificial cells, and here we have an example of work on an artificial extracellular matrix. Building an appropriately complex and supporting scaffold - a matrix - for tissue engineered organs is a challenge presently facing researchers. So what could be done with the ability to turn out extracellular matrix to order? "The tissue in our bodies has a combination of traits that are very hard to recreate in synthetic materials: It is both soft and very tough. A team [has] now developed a novel, highly porous, sponge-like material whose mechanical properties closely resemble those of biological soft tissues. ... it consists of a robust network of DNA strands and carbon nanotubes. ... Different protein morphologies in the extracellular matrix produce tissue with a wide range of stiffness. Implants and scaffolding for tissue growth require porous, soft materials - which are usually very fragile. Because many biological tissues are regularly subjected to intense mechanical loads, it is also important that the implant material have comparable elasticity in order to avoid inflammation. At the same time, the material must be very strong and resilient, or it may give out. The new concept uses DNA strands as a matrix; the strands completely 'wrap' the scaffold-forming carbon nanotubes ... This results in materials that are as elastic as the softest natural tissues while simultaneously deriving great strength from the robust DNA links." In the unlikely event of significant revenue sharing (e.g. more than the two dollars total I'm expecting) I'll donate the proceeds to either the Methuselah Foundation or SENS Foundation. 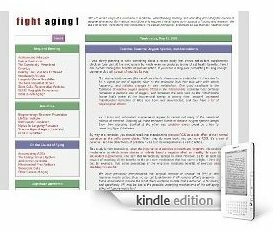 I encourage the folk in the community who write on similar topics to those here at Fight Aging! to take the plunge as well. There's nothing to lose, and a little more of an audience to potentially gain. Signing up is straightforward, takes only a few minutes, and I see no downside for those of us who cast forth our writings to the world for all to benefit from. An interesting piece from innovations report: "Moderate calorie restriction causes temporal changes in the liver and skeletal muscle metabolism, whereas moderate weight loss affects muscle ... 22 obese patients were randomized to a high-carbohydrate or low-carbohydrate [calorie restricted] diet. ... insulin action, cellular insulin signaling and [liver] triglyceride (IHTG) content [were determined] ... Researchers found that short-term CR caused a rapid decrease in IHTG content, an increase in [liver] insulin sensitivity and a decrease in endogenous glucose production rate, whereas longer-term CR and a moderate 7 percent weight loss improved skeletal muscle insulin sensitivity in conjunction with an increase in cellular insulin signaling. The effect of moderate CR in obese patients with either a low-fat or low-carbohydrate diet on metabolic function is a continuum, with differential effects on specific organ systems." The same sort of result most likely holds in people of normal weight, based on what I know of past research. Some benefits of CR take effect rapidly, some not, and the precise details vary with the details of diet. 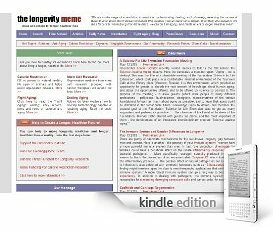 Of interest to those who like to see how the other half thinks about engineered longevity, here is a long post from a political philosopher in the "social justice" (i.e. forced redistribution of property) camp: "One of Rawls's 'simplifying' assumptions is that all the participants in the social contract are healthy, productive members ... Rawls invoked this simplifying assumption to help bracket particular complexities like healthcare, and in so doing come to an understanding of how wealth and income should be distributed and the weight to place on rights and freedoms. The problem is that this one simplifying assumption pretty much erases many of the central questions of justice that are in need of being addressed. To bracket them, so that attention can be placed on wealth, income and rights and freedoms gives one the impression that science and health policy are secondary, or even tertiary concerns. And that has certainly been the (unfortunate) consequence for the field 4 decades later. The reality today is that the inborn aging process is now the major risk factor for disease and death after around age 28 in the developed countries and limits average life expectancy at birth to approximately 85 years ... Aging predisposes our bodies to fall apart, making us vulnerable to chronic diseases like cancer, heart disease and stroke. Advances in evolutionary biology point us in the direction of potential interventions in the aging process that could expand the opportunities humans could have for health. Our neglect of human biology and science in general is unjustified." Researcher Leonid Gavrilov recently visited Russia to talk to the folk behind the Science Against Aging initiative. Here, he translates a meeting report: "Aging -- not a destiny! This was the title of a charitable meeting of the Foundation 'Science for Life Extension', which took place in a comfortable informal environment of the Tsurtsum Cafe at the Winery place (Moscow, Russia). It is this environment, which provided an opportunity for guests to absorb the vast amount of knowledge about human aging, and about the opportunities offered, and to be offered by science to combat it. The purpose of the meeting - to allow guests (which were people of many different professions - politicians, businessmen, designers, representatives of the various foundations) to learn as much about aging as possible, and to learn that aging could be defeated in the foreseeable future. Knowledge leads to action, and therefore the second goal of the Foundation 'Science for Life Extension' was to get as many supporters and partners as possible. ... The chairman of the Board of Trustees of the Foundation, Michael Batin shared with guests his plans, and the most important of them - the development of an integrated interdisciplinary program 'Science against aging'." There are plenty of candidate mechanisms for the well-known longevity gap between men and women. Here is another - the potency of your immune system: "women have a more powerful immune system than men. In fact, the production of estrogen by females could have a beneficial effect on the innate inflammatory response against bacterial pathogens. ... More specifically, estrogen naturally produced in women seems to block the production of an enzyme called Caspase-12, which itself blocks the inflammatory process. ... The positive effect of natural estrogen on our resistence to infection is also exhibited with synthetic hormones such as 17-beta-estradiol. This finding might therefore open the door to new therapeutic applications that reinforce the immune system." A more robust immune system can go a long way to boosting life expectancy. In addition to dealing with pathogens, the immune system is also responsible for eliminating damaging senescent cells and cancer cells, for example. The thoughts of others for a change today; I'm sure you all know by now where I stand on "society" and devious but hard-to-avoid words like "we" and "should." What really bothers the hand-wringers, I think, is the radical nature of the transformation which is coming. Eliminate aging and we do away with the pain and devastation that it causes directly, as well as the pain and devastation that it enables via accompanying diseases such as cancer, diabetes, and heart disease. Eliminate aging and we do away with that long treacherous death march of people lining up for their last six months of life and all the expensive medical care that goes with it. Everything that follows is muddied by our present socialism. The rules made and vast sums of money moved around (and wasted) by government employees distort all businesses, all decisions, all processes in medicine. Once you step into the swamp and start debating which clump of mud should be over here versus over there, then every argument you make has the largely ignored cost of government waste and government regulation attatched to it. Whatever relative good might emerge from your proposals - and even relative good is very hard for governments to achieve, given the incentives of those involved - is inevitably far outweighed by the costs imposed by the very existence of government. To put it another way, the FDA and the terrible ruin it has made of medicine is a natural outgrowth of a government large enough to fund a diverse research organization like the NIH. So the FDA will latch itself onto any new significant government-funded research venture and make it prohibitively expensive to apply the results, stifling any nascent and inventive culture of for-profit development. ithin the next five years, it's quite possible that physicians will come into routine possession of a remarkable set of tools - a brand new way of dealing with the frailty and disabilities of aging. The tool kit is autologous stem cells derived from the patients themselves, amplified in culture, and infused back into the patient according to a precise protocol. It would be such a leap from today's medical diagnostics and treatments; it could only be called revolutionary. The purpose of employing autologous cells is to prevent rejection of histo-incompatible cells by the patient's immune system. But it's also possible that these new therapies could slip from our grasp, at least in the US. If we're not careful, these therapies could become the exclusive domain of the pharmaceutical industry, as regulated by the Federal Food and Drug Administration (FDA). This could push the availability of this tool kit 15 to 20 years into the future. The opportunity-cost in terms of morbidity and mortality could be catastrophic. Big enough to give you what you want is big enough to take away everything you have - except that governments don't do so well at giving you what you want in the first place. Typically the end result of a "successful" campaign by the public is the worst of all worlds, where whatever resources are made available are siphoned off for short-term gain by connected elites, and the cost of providing those resources falls squarely on everyone else. A call for vast funding is in essence a call for vast corruption and waste, followed by oppressive new regulations that slow or halt private initiatives. This is the way the world works, sadly. If your future is entwined with the development of a potentially transformative medicine technology, your best bet is to commercialize clinical applications outside Europe and the US. Only there are you going to find regions that allow you the freedom to move more rapidly and efficiently towards therapies. From the Technology Review: "Our joints are one of the first body parts to suffer the inevitable ravages of aging: cartilage may be torn in overzealous basketball games or slowly worn away over years of use. Scientists are now experimenting with a combination of stem cells and novel scaffold materials designed to mimic real tissue, in hopes of permanently vanquishing the pain that accompanies this damage and perhaps preventing the onset of arthritis. In animal models, these transplants appear to spur regeneration of cartilage that better resembles native tissue. ... In a recent pilot experiment in pigs, researchers sutured the cell-laden scaffolds over damaged cartilage in the animals' knees. Six months later, new tissue had formed, with a smooth surface and mechanical properties similar to those of native cartilage. The tissue also expressed molecular markers characteristic of normal cartilage. ... he aims to begin human tests in the next two years. First, his team must do additional studies in large animals, such as goats or sheep, over a longer period of time, to make sure that the treatment is safe and effective." Are there comparatively simple, localized tweaks to human biochemistry that could be tested and implemented in a short enough timeframe to benefit the health and longevity of those of us reading this today? Perhaps. This might be one of them: "Oxygen metabolism (the process by which living cells produce energy), leads to the production of highly reactive oxygen species (ROS), which can cause significant neurodegenerative damage in cells that are unable to protect themselves. This is seen most remarkably in aging cells, which experience both an increase in ROS production and a decrease in defense mechanisms, a condition known as oxidative stress. Through their examination of cells in the laboratory, the researchers concluded that potassium channels are targets of ROS, resulting in modification to the cell that causes neuronal dysfunction. The researchers showed that by modifying a single cysteine residue, they could make the potassium channel resistant to oxidation, thereby allowing for normal functioning of the nervous system." I post on the details of aging biochemistry and research papers much more than I used to in past years. This is a consequence of my own process of educating myself about the biology, biotechnology, and weight of evidence underpinning the Strategies for Engineered Negligible Senescence, calorie restriction, and what I'll call the Longevity Dividend viewpoint of working to slow aging through metabolic manipulation. If it makes some eyes glaze, so be it. This is important. I do try to structure things in an educational fashion, but the further one goes into the jungle, the harder it becomes to recall how to present this information to the layman. (Assuming the layman is interested, which most casual visitors are not in this day and age - we live in the era of tl;dr). As a general rule, I usually prefer to learn more about a topic rather than take someone else's word for it - and if I'm advocating something, how could I expect to be taken seriously unless I have at least a basic grounding in what I'm talking about? When I castigate metabolic manipulation as a path forward, I do so having looked at a great deal of research and basic biology to form my views. Does that effort make me right? No, but it does at least increase my chances of being so, and my chances of avoiding elementary errors. Sadly, most people won't take the time to learn about their biochemistry until it runs awry and starts killing them - which is too late for the most effective presently available strategies of prevention. There are many fields and personal situations in which it makes perfect economic sense to be ignorant - to rely on experts and focus your attentions elsewhere. Maintenance of cars, for example. That said, I think that a knowledge of the workings of the body is not something you can afford to leave entirely to others. If you don't have a basic grasp on how your metabolism runs and what the present scientific thinking is on regions of importance, how can you evaluate new advances or health strategies? How do you distinguish between serious research, outright fraud, and earnestly held but outdated and wrong viewpoints? Ignorance is vulnerability, and the cost of that is measured in ill health and lost years. Researchers continue to investigate the klotho gene and the effects it may have on human longevity: "In mice a defect of Klotho gene expression results in multiple aging-like phenotypes including short lifespan, osteoporosis and atherosclerosis, while its over-expression suppresses aging and extends lifespan. Contrasting data have been reported as far as the importance of the functional variant of Klotho termed "KL-VS" on human longevity, depending on the average age of the old subjects that were compared with young controls. We therefore performed a study on a large Italian population sample including people from very young to very old age (centenarians). ... found a significant increase of the heterozygous Klotho genotype in the class of elderly [non-centenarian] people compared to young controls. On the contrary, no difference was present between centenarians and young controls. [This is] is compatible with the hypothesis that this KL-VS heterozygous genotype is favorable for survival in old people, its beneficial effect decreasing thereafter. ... alleles and genotypes involved in aging and longevity may exert their biological effect at specific time windows." So evidence suggests one klotho variant helps humans survive into old age, but don't help us make it to extreme old age - which raises more questions as to the underlying mechanisms. Chris Patil of Ouroboros adds some pertinent thoughts to a recent Fight Aging! post on macroautophagy research: "stimulation of one autophagic pathway can reduce plasma lipoproteins and triglycerides ... Is the decrease in blood lipids a consequence of every cell in the body upregulating autophagy and therefore needing more cholesterol and triglycerides in order to rebuild membrane-bound organelles, or is this a consequence of the drug acting mainly on specific tissues/organs? ... Is there a down side? I'm wondering whether the effects of accelerating macroautophagy will be uniformly beneficial to all cell types. I'm especially concerned with respect to cognitive function: In worm and fly, age-related neuronal death is mediated by autophagy and there's building evidence that the same is true in mammals. (This makes sense: Cellular homeostasis is a balance between creation of new components and destruction of old ones; one can easily imagine a delicate and finicky cell like a neuron losing control of this balance if the rate of degradation were to suddenly rise)." On the other hand, wouldn't calorie restriction cause issues due to its boost to autophagy if that were the case? We'd all like to see life span studies in mice, I think. Aging is characterized by several metabolic changes responsible for the decline of certain functions and the appearance of age-related diseases, including hypercholesterolemia, which is the main risk factor for atherosclerosis and cardiovascular disease. Caloric restriction (CR) was shown to increase longevity and prevent age-related diseases in various organisms, and to counteract the age-associated increase in plasma cholesterol. CR was thought to operate through the stimulation of the process of macroautophagy. The aim of this work was to investigate the effect of the stimulation of macroautophagy on age-associated cholesterolemia. Results show that the stimulation of macroautophagy reduces the total LDL and high-density lipoprotein (HDL) cholesterol plasma level to juvenile values, and triglycerides levels even lower. [The action of the compound does not require] the counteraction of the age-related increase in lipoperoxidation, and only involves a restoration of the numbers of LDL receptors on liver membranes to juvenile levels. Which is unfortunate, given that peroxidation of lipoproteins like LDL is one way in which damaged mitochondria spread increasing destruction through the body's tissues. You'd think that more macroautophagy would mean fewer damaged mitochondria, and therefore fewer oxidatively damaged lipids, but apparently not. Or not within the timescale of this study, anyway. An aside on the liver and it's levels of receptors: last year researchers demonstrated a way in which liver function could be restored through boosting the number of receptors to keep them at youthful levels. That and this research are two quite different topics, but this is an interesting commonality. I wonder where else receptor levels might crop up in relation to aging and important metabolic processes involving the liver's specialized tasks? Given the present interest in developing calorie restriction mimetic drugs, I expect increasing amouts of money and interest to flow into tinkering with autophagy in the years ahead. All the same reasons and hoped-for outcomes apply. If you're interested in the history of antilipolytic compounds in longevity research, you should do some digging at PubMed - see for example, this paper from the same folk back in 2003. They've been working on this for a while. Genetic disruption of insulin and insulin-like signaling pathways may extend lifespan. Hyperinsulinemia and insulin resistance may accelerate aging. It is concluded that life-long weekly-repeated transient inhibition of insulin secretion by antilipolytic drugs may have an anti-aging effect, additive to the anti-aging effect of a milder caloric restriction. Speculation is that transiently lower plasma insulin levels might stimulate the anti-aging cell-repair mechanism autophagy, which has longer lasting effects on cell housekeeping. We can all knowingly look at the smokers, but how often have you thought about what else you might be doing or failing to do that is known to greatly impact life expectancy? From EurekAlert! : "Non-smokers live longer and have less cardiovascular disease than those who smoke, according to a 30-year follow-up study of 54,000 men and women in Norway. ... deaths were recorded by linkage to the Norwegian population registry and, between 2006 and 2008, those surviving responded to a follow-up questionnaire. This allowed division of the participants according to their smoking status - never-smokers, ex-smokers, current smokers of 1-9 cigarettes a day, 10-19 cigarettes a day and more than 20 cigarettes a day (the last group referred to as 'heavy smokers'). Results showed that, from the original 54,075 participants, 13,103 had died by the time of follow-up. But it was a significant finding that, of these, 45% of the heavy-smoking men had died during the 30 years, compared to just 18% of the never-smokers. Similarly, 33% of the heavy-smoking women had died, but only 13% of the never-smokers. ... These results show what a tremendous impact smoking has on mortality. We are talking about very high numbers of people." Now recall that failing to exercise has roughly the same impact on life expectancy as smoking. This is interesting, though I have to wonder how it will interact with the findings relating to methionine and calorie restriction in higher animals. Researchers have shown "that yeast cells maintained on a glycerol [rather than glucose] diet live twice as long as normal - as long as yeast cells on a severe caloric-restriction diet. They are also more resistant to cell damage. ... genetically engineered long-lived yeast cells that survive up to 5-fold longer than normal have increased levels of the genes that produce glycerol. In fact, they convert virtually all the glucose and ethanol into glycerol. ... When the researchers blocked the genes that produce glycerol, the cells lost most of their life span advantage. ... [Researchers] believe that the 'glucose to glycerol' switch represents only a component of the protective systems required for the extended survival. ... This is a fundamental observation in a very simple system, that at least introduces the possibility that you don't have to be calorie-restricted to achieve some of the remarkable protective effects of the hypocaloric diet observed in many organisms, including humans. It may be sufficient to substitute the carbon source and possibly other macronutrients with nutrients that do not promote the 'pro-aging' changes induced by sugars." While for-profit startup costs are well known and a great many well-oiled structures exist to match up funding sources and entrepreneurs, the comparable early stage and low-cost situation for scientific research is very much still in the dark. There are few organizations or initiatives that could be compared with those in the for-profit startup space, working to generate interest for early stage funding of specific low-cost but important science projects. We can ascribe some of that difference to the lack of a profit motive - you're not getting a direct and bookable financial return on your investment. But put that to one side and consider this: why do people give five figure charitable contributions to cause-focused intermediaries (e.g. a cancer non-profit, or the SENS Foundation) rather than find early stage, important projects they would like to fund themselves? I don't think we can blame that on complexity or lack of knowledge, given that angel investors looking at for-profit startups are in exactly the same position of ignorance regarding the vast range of potential projects to invest in and the huge complexities of their industries. No. I think it's the infrastructure - or rather the lack of infrastructure surrounding early stage scientific research. The web of relationships, technology, and eager passage of information that enables a dynamic start-up culture is lacking for early stage research. A yawning gulf separates research communities from the many purses that might be opened were the connection made. People donate to research via intermediary organizations with broad goals because there is no readily available, widely understood way to do anything else. As we move into the second decade of this most interesting century, the cost of answering questions and producing important new results in scientific research will continue to fall. The breadth of important, game-changing work that could be accomplished by a post-grad in a few months - already much larger than people think - will increase. There is a tremendous, growing incentive to open up the whole early stage funding situation for far greater transparency and outreach. The more that people can see exactly what they are funding, the more they will become involved. This principle of involvement is presently being demonstrated in the broader non-profit space. Things like Kiva are one example, but others that are purely donation focused exist as well. I see no reason why such an effort could not flourish for branches of life science research - and in particular the longevity science that is important to us all. While methionine restriction brings similar longevity and health benefits to calorie restriction where it has been tested, it doesn't appear to be quite the same thing under the hood - probably meaning the calorie restriction operates through additional mechanisms beyond a reduction in methionine intake: "Life span can be extended in rodents by restricting food availability (caloric restriction [CR]) or by providing food low in methionine (Meth-R). Here, we show that a period of food restriction limited to the first 20 days of life, via a 50% enlargement of litter size, shows extended median and maximal life span relative to mice from normal sized litters and that a Meth-R diet initiated at 12 months of age also significantly increases longevity. Furthermore, mice exposed to a CR diet show changes in liver [biochemistry, including gene expression patterns] that are not observed in liver from age-matched Meth-R mice. These results [suggest] that the spectrum of metabolic changes induced by low-calorie and low-methionine diets may differ in instructive ways." This is also a helpful reminder that starting calorie restriction later in life isn't a waste, and can still provide significant health benefits. Being able to safely destroy or reprogram very specific cell populations will enable a wide range of very useful therapies. Here's an example of what's going on in the labs these days: researchers "have developed the basis for a four-in-one agent that can detect, target, and disable tumor cells while also making them [visible]. ... their work involves magnetic iron oxide particles with a fluorescence dye, RNA fragments, and a special peptide attached. The peptide is present to specifically identify the cancer cells; the RNA fragments suppress the special cancer-cell genes, killing the cells. The magnetic particles act as a contrast agent for magnetic resonance imaging, and the fluorescence dye allows for microscopic imaging of the target cells. ... mRNA is a good point of attack to stop the synthesis of proteins required for tumor growth. To achieve this, siRNAs (small interfering RNAs) are introduced into the cell. ... When bound to nanoparticles, the siRNAs are easier to slip into cells. In order to specifically target cancer cells, the particles carry a short peptide, called RGD, which points the way: RGD strongly binds to an integrin, a membrane protein that is anchored to metastasizing tumor cells in much higher amounts than in healthy tissue. The integrins with RGD-equipped nanoparticles are actively brought into the cell interior with their cargo intact." The synopsis: mitochondria, the power plants of your biology, have several methods of turning food into ATP, the chemical used as fuel by your cells. The primary method is OXPHOS, but this generates free radicals that can sometimes so damage a mitochondrion that it can no longer run the OXPHOS process. It then switches to a secondary (and less efficient) process that has two effects: a) the mitochondrion becomes far less likely to be recycled along with other worn cellular components, so eventually only damaged mitochondria are left in a cell, and b) enough of these damaged mitochondria bring their cell into a state of imbalance that can only be solved by dumping large quantities of free radicals into the surrounding tissue. That in turn causes all sorts of wide-ranging damage to the body's biochemistry, building up over time. A number of research groups are toiling away at solutions to this portion of the aging process, such as replacing mitochondria entirely, replacing the damaged portions that cause OXPHOS to falter, or moving the critical components of OXPHOS biological machinery elsewhere in the cell such that it will continue to work even if the mitochondria suffers damage. The key gene (single-subunit alternative oxidase or AOX) in essence acts as a bypass for blockages in the so-called oxidative phosphorylation (OXPHOS) [process] in mitochondria. Howard Jacobs, who led the study at the University of Tampere in Finland, likens that chain to a series of waterfalls in a hydroelectric power station. Only, in the case of mitochondria, it is electrons that flow to release energy that is captured in molecular form. "This is the first whole organism test for the idea that you can take a gene that encodes a single polypeptide and bypass OXPHOS where it is blocked," said Jacobs, emphasizing that OXPHOS includes dozens of components and hundreds of proteins. "You may lose power from one [molecular] 'turbine,' but power from the others can be restored. With a single peptide, you can bypass two-thirds of the system. That's the beauty of the idea." They introduced the gene into human cells by inserting DNA taken from the urochordate Ciona intestinalis. Those studies found that the protein encoded by the Ciona AOX gene made its way to mitochondria, where it conferred cyanide-resistant respiration and protected against metabolic acidosis, oxidative stress, and cell death when cells were treated with OXPHOS inhibitors such as antimycin or cyanide. Now, they've shown that the same holds true in a living animal. Importantly, ubiquitous Ciona AOX activity had no apparent ill effects for the flies. Quite the contrary, mitochondria taken from AOX-expressing flies showed significant resistance to cyanide, and the flies partially resisted both cyanide and antimycin. AOX also rescued the movement defect and excess production of reactive oxygen species by mitochondria in flies with a mutant version of a gene known as dj-1b, which is the fly equivalent to the human Parkinson's disease gene DJ1. So they can get OXPHOS partially running even where damaged enough to normally be non-functional - which sounds like it might be a viable partial solution to this form of age-related biochemical damage. I would be interested to see the results of a mouse life span study run with this genetic alteration. Some evidence suggests that the worst effects of Alzheimer's disease can be repaired - that memories are not destroyed, but rather become inaccessible. Researchers have "pinpointed the exact gene responsible for a 2007 breakthrough in which mice with symptoms of Alzheimer's disease regained long-term memories and the ability to learn. ... HDAC2 regulates the expression of a plethora of genes implicated in plasticity - the brain's ability to change in response to experience - and memory formation. ... Several HDAC inhibitors are currently in clinical trials as novel anticancer agents and may enter the pipeline for other diseases in the coming two to four years. ... The researchers conducted learning and memory tasks using transgenic mice that were induced to lose a significant number of brain cells. ... after taking HDAC inhibitors, the mice regained their long-term memories and ability to learn new tasks. In addition, mice genetically engineered to produce no HDAC2 at all exhibited enhanced memory formation. The fact that long-term memories can be recovered by elevated histone acetylation supports the idea that apparent memory 'loss' is really a reflection of inaccessible memories ... These findings are in line with a phenomenon known as 'fluctuating memories,' in which demented patients experience temporary periods of apparent clarity." Video at KTLA: "There's no escaping the inevitable...all of us and our loved ones will grow old. But now a cutting edge group is doing something about aging. At the southern California offices of Methuselah Foundation, KTLA has met a man who says we can live as long as our scientific imaginations allow. Methuselah Foundation creative director Roger Holzberg says it's simple: together let's aggressively attack the diseases of aging! ... Over the last century, the extent of a healthy life span has increased dramatically as we started to conquer illnesses like polio. and there is no reason why the diseases of aging can't fall like polio did, over the next decade," Holzberg says. The work of the Foundation operates on several levels: first, there's short-term care through their web site, offering 'tips for life.' Another level in the battle against aging is the 'M Prize' - it's a huge cash prize the Foundation is offering, to anyone who can best prolong life in lab animals. The 'prize strategy' is working. Already one of the entrants has helped lab mice live well beyond their years." A growing body of research suggests that the bacterial populations existing in symbiosis with your tissues play an important role in how metabolic processes interact to determine longevity. This is yet another good reason not to bet on metabolic engineering as the fast horse in the race to produce engineered longevity - the complexity is staggering. Generally, there is an age-related decline in the human gut titer of Bifidobacterium species, but the titer in healthy centenarians was previously reported to be comparable to that found in much younger people. We addressed whether elevated Bifidobacterium titers relate positively to immune function. This study evaluated the immunoactivities of 2 Bifidobacterium strains (B adolescentis BBMN23 and B longum BBMN68) isolated from healthy centenarians in China. In conclusion, ingestion of B. adolescentis BBMN23 and B. longum BBMN68 can enhance both innate and acquired immunity in healthy specific pathogen-free (SPF) mice and strains of bifidobacteria from healthy centenarians in Bama longevity villages in China may possess potentially valuable immunomodulatory properties. A immune system in better shape should be enough to raise life expectancy in and of itself, as the immune system not only protects against pathogens, but also destroys damaging senescent cells and cancerous cells, amongst other jobs. The whole point of a serious program of longevity research, of course, would be to make irrelevant the range of metabolic differences in human populations and the bacteria that inhabit us. These differences are only interesting because we don't yet have a method in hand for reliably adding multiple decades to healthy and maximum life spans - for all that we can clearly and in great detail envisage what that method looks like. One important contribution to the buildup of atherosclerotic plaques and eventually atheromas is the damaged lipids generated by age-related damage to your mitochondria. Here, researchers look at what happens further down the line when the plaques become dangerous: "some 2 percent of all plaques [will] eventually lead to the development of an acute blood clot and to heart attack, sudden death, or stroke. ... The billion dollar question is why 98 percent cause no problem, and 2 percent do. ... Their report adds support to the notion that so-called endoplasmic reticulum (ER) stress together with the body's natural way of coping with that stress is one answer. ... In the case of atherosclerosis, ER stress within plaques could lead to the massive death of cells - and of macrophages in particular - leading to the generation of a structure called the 'necrotic core.' Those necrotic cores are known to be a defining feature of plaques that are vulnerable to rupture and blood clot formation." The researchers show that mice lacking the cell death response to ER stress suffer half the number of blood clots. As always, however, a much better solution would be to regularly clear the plaques rather than tinker with fundamental cell mechanisms to try and make the plaques less dangerous. If we could introduce a very large number of active immune cells into the body for a short while, far more than the body generates by itself, we could solve a lot of problems - such as cancer. Here, a research team "demonstrated natural killer cells [derived] from human embryonic stem cells are better at killing human leukemia in mice, preventing the cancer from metastasizing in any of the animal's organs. The study has also shown stem cell-derived tumor-killing cells are highly effective in killing breast cancer, prostate cancer, testicular cancer and brain tumor cells. ... We've now proven that these cells are much more potent and effective at killing tumor cells than those coming from other sources like human umbilical cord blood, and we've been able to identify some of the reasons why. ... the next goal is to produce enough of the cells to treat humans, rather than mice. ... Based on the history of cell-based therapies at the university, I see this as very feasible. But it will take time based on the resources available to get to the scale of human treatments." You might also recall the similar GIFT immune therapy that produced very impressive results, but is presently buried beneath FDA regulatory requirements - as is all the most promising new biomedical technology. When forceful, powerful government intrudes into any field of human endeavor, the end results are much the same: ruination. The only questions relate to how long it takes to get there and the small details of how that ruin unfolds. The incentives of bureaucrats are almost exactly in opposition to the direction of progress, and the existence of a powerful regulator distorts all surrounding endeavors. A good example of this downward spiral in action is formed by the FDA and pharmaceutical industry in the US. The FDA continues to ratchet up the cost of producing new medical technology to the point at which progress is slowed to a crawl. The short term cost incurred by a politician in blocking advances is far less than that accrued by allowing advances to proceed. The pharmaceutical industry uses the FDA as a weapon to protect itself from progress in the form of competition, disruptive new technologies, and other endeavors that will greatly help health and longevity. This system of short-termism, chains, and sabotage will eventually destroy the for-profit medical and biotechnology research industry in the US. Short of a revolution, that is the inevitable end state. With that cheery truth in mind, here's an article from the perspective of infighting between those groups using the FDA as a weapon to protect their profits or livelihoods. That one group is more interested in rapidly developing new technologies than the other is somewhat moot. By engaging with the FDA and regulatory structures, they only add support to the root of all the problems. Within the next five years, it's quite possible that physicians will come into routine possession of a remarkable set of tools - a brand new way of dealing with the frailty and disabilities of aging. The tool kit is autologous stem cells derived from the patients themselves, amplified in culture, and infused back into the patient according to a precise protocol. It would be such a leap from today's medical diagnostics and treatments; it could only be called revolutionary. I discussed the consequences of a two decade cost in time due to regulation a little while ago. It isn't pleasant. The sane approach for anyone interested in funding for-profit progress in the near future is probably to perform fundamental research in the US - whilst there are still high quality research communities in the country - and then shift all development and clinical practice overseas to less oppressively regulated regions. But that's still going to be a fraction of what might have been. Seen from above, we humans are our own worst enemy. If my generation leaves the stage without having witnessed the advent of true rejuvenation through repair-based biotechnology, it will be because too many of us chose not to achieve that goal, preferring instead to wallow in self-destructive systems of governance. Unsuprisingly, women who can give birth later in life tend to live longer - unsurprising at least from a reliability theory viewpoint of aging as accumulated damage. If you can have a child later in life, you are most likely less damaged than your peers, and therefore more likely to live longer. "Women who have babies naturally in their 40s or 50s tend to live longer than other women. Now, a new study shows their brothers also live longer, but the brothers' wives do not, suggesting the same genes prolong lifespan and female fertility, and may be more important than social and environmental factors. ... Women who had 'late fertility' - a birth at age 45 or older - were 14 percent to 17 percent less likely to die during any year after age 50 than women who did not deliver a child after age 40. That confirmed earlier studies. But those studies did not determine if the women gave birth later and lived longer because of genes or because of social and environmental factors such as good nutrition or healthy living. ... The study didn't address how much longevity is due to genetics, [but] scientists believe genes account for up to 25 percent of differences in longevity." The real lesson to take away from this is that the majority of factors influencing your longevity are not genetic and therefore under your control. A good example of more straightforward nanoengineering taking place in cancer research laboratories from ScienceDaily: "tumors in mice that received an intravenous injection of nanorods plus near-infrared laser treatment disappeared within 15 days. Those mice survived for three months with no evidence of reoccurrence, until the end of the study, while mice that received no treatment or only the nanorods or laser, did not. Once the nanorods are injected, they disperse uniformly throughout the bloodstream. Bhatia's team developed a polymer coating for the particles that allows them to survive in the bloodstream longer than any other gold nanoparticles (the half-life is greater than 17 hours). In designing the particles, the researchers took advantage of the fact that blood vessels located near tumors have tiny pores just large enough for the nanorods to enter. Nanorods accumulate in the tumors, and within three days, the liver and spleen clear any that don't reach the tumor. During a single exposure to a near-infrared laser, the nanorods heat up to 70 degree Celsius, hot enough to kill tumor cells. Additionally, heating them to a lower temperature weakens tumor cells enough to enhance the effectiveness of existing chemotherapy treatments, raising the possibility of using the nanorods as a supplement to those treatments."